It was a triumphant return to Sonic Boom 2016 in Janesville, WI. The two day festival on October 1st and 2nd 2016 found LB interviewing and photographing a Who’s Who of hard rock including Disturbed, KoЯn, Avenged Sevenfold, Breaking Benjamin, Chevelle, Ghost Alter Bridge, Sevendust, Pop Evil, Trivium, Parkway Drive, Pierce the Veil, 3 Doors Down, Hellyeah, Motionless in White, Avatar, The Amity Affliction, Dope, Young Guns, Wayland, Skindred, Adelita’s Way, Nonpoint, Crobot, I Prevail, Devil to Drag, and Breech. Gratitude to WJJO for bringing LB in once again to host and hang. Thanks also to the rockers of Wisconsin for all the love! It was an incredible weekend of rock as Slipknot, Lou’s favorite band, returned to the concert stage with a vengeance and over 50,000 fans in tow for Knotfest in San Bernardino, CA. The trip was insane for LB as he interviewed dozens of artists backstage including Slipknot, Five Finger Death Punch, Volbeat, In This Moment, Nothing More, Otep, Miss May I, Killswitch Engage, Avatar, HellYeah and many others. He was also honored to be onstage announcer and host of the world wide webcast, seen by millions of Maggots around the planet. While backstage, Lou was also guest on the Roadrunner Records podcast with Mark Abramson. You can give it a listen here. We expect LB to guest again on it early in 2015. Brutus extends his sincere thanks to Slipknot, 5B Management, Roadrunner Records, John Reese and the crew at GTV. Massive props also go to Rob Fortenberry Photography for shadowing Lou throughout the event and getting incredible images! 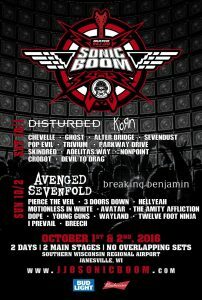 On September 13th 2014, Brutus was onstage to host the first ever Sonic Boom festival in Janesville WI. It featured performances from A Day to Remember, Bring Me the Horizon, Motionless in White, All That Remains, Devour the Day, Avatar, Nonpoint, Starset, and a ton of others. As Lou hadn’t slept in a few days, he got a little weird and insisted on wearing a rubber horse head for much of the day, both onstage and backstage. Some of those images are below. Thanks to Randy Hawke, Bonnie Oleson and the crew at WJJO in Madison WI for the love.